Who loves Pinterest? I do! And Lord knows I have pinned tons of delicious recipes on there that I want to try! But I thought it might be fun to devote a blog post to the recipes I actually HAVE tried and would totally recommend to you! The links under each picture will take you back to the original blog where the recipe was posted. 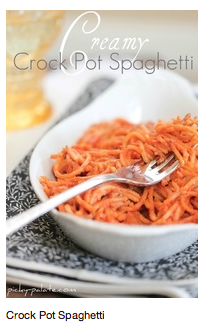 This Crock Pot Spaghetti is one of the most recent things I've tried. 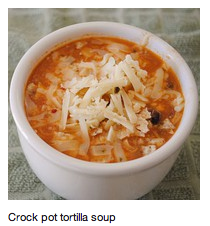 I love a good crock pot recipe! It couldn't be easier to make, and doesn't take a lot of ingredients... made lots of leftovers and Tyler and I both loved it! I like this better than traditional spaghetti & meat sauce, just sayin'! 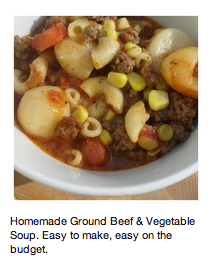 You gotta love a good, hearty vegetable beef soup! This one is great, and you can totally customize it and throw in whatever veggies you love! I also added some tomato paste to thicken the broth a bit and make it more of a "stew"... I also used whole wheat pasta to make it a little healthier. Even after you refrigerate the leftovers, the flavors continue to mix and it becomes even better! OMG. This chicken enchilada soup is a flavor party in your mouth!! Mexican food lovers- please try this. I love how the base of the soup is slightly creamy, and you can really spice it up to your desired level. Super easy to make in the crock pot, and is so great garnished with a little extra cheese and some Frito's corn chips! How cute are these mummy dogs?! Such a fun thing to make for a Halloween party. I don't care how old you are, the "pig in a blanket" concept of a hot dog & a crescent roll is always delicious. Wrapping the hot dog with the crescent roll strips can be a bit tricky, but it doesn't have to be perfect! Serve with some ketchup & mustard and enjoy! 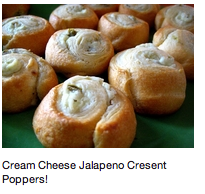 I threw these cream cheese jalapeno crescent roll poppers together for a potluck-style party a couple of months ago. Do you like jalapeno poppers? You will LOVE these. Even if you aren't into spicy stuff, I found these to be rather mild, but with just the right amount of kick. They're bite size and are super yummy right out of the oven, but even after they cool, they're great. Try them out for your next gathering! Had to throw in this recipe that I pinned! 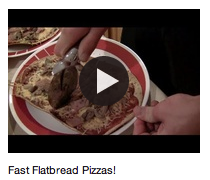 Tyler and I continue to make these flatbread pizzas! Top them however you want and enjoy! While the crust is thin, it can cure a pizza craving with a lot less calories! Click the link for my how-to video! I love a good pasta salad, and this Avocado & Lime pasta salad is one of my favorites. In general- whether you're whipping up an egg salad, chicken salad, or this... avocado can make a nice mayo substitute. This particular recipe calls for a little mayo, but not as much as you might add to a typical creamy pasta salad. The lime & cilantro gives great flavor, and I also added frozen corn to it. It's my new go-to pasta salad! More fun with avocados! :) This creamy avocado dip flat out ROCKS. I love that greek yogurt is involved, because that adds a little protein content, and is healthier than, say, sour cream. 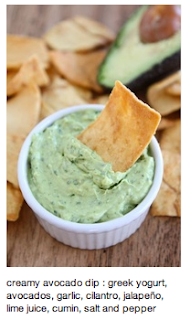 Use it as a dip for chips, a taco topping, or a spread for sandwiches! This is another one Tyler went gaga for! So... I like corn. 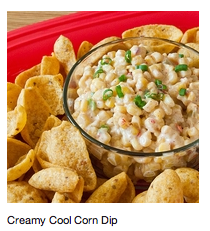 So I was immediately attracted to the Creamy Cool Corn dip when I saw it on Pinterest. It did not disappoint! I love the subtle sweetness of the corn and you know what else I added? Some bacon bits! You could use real ones, but I just used the crunchy imitation ones... they soften a bit and give a nice flavor! Now's the time to start making these 2-ingredient pumpkin muffins! 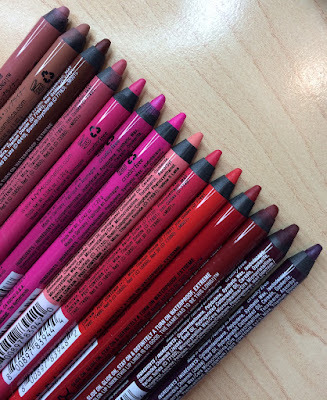 I mentioned these in my recent TJ Maxx haul... they are absolutely delightful! So moist & flavorful. I like using a spice cake mix, but recently picked up a butter pecan mix to try! For more of a muffin-vibe, you don't need to frost them. But for a decadent cupcake- a little cream cheese frosting is great! And you know what's funny? Instead of even pretending like I've slaved over these, I proudly tell people I only used 2 ingredients and they are baffled and impressed! Last but not least, I gotta give some love to my mom's homemade apple pie. My mom (Jackie) shot a video with me on how to make it! It's absolutely the best apple pie-- and the most fantastic crust you will eat. 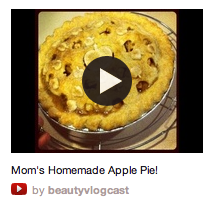 I pinned it on Pinterest, but of course it's also on Beauty Vlogcast. Since posting this video, many people have tried the recipe and shared their pie pics with me- they all looked awesome!! Posted a new video just a bit ago! Shopping List Ideas! Tomorrow is Friday and I am PUMPED as usual. I talk to my mom everyday on the phone & had an especially good chat with her today. Cupcake is sitting by my feet right now- a purring machine! Shower time for me! Have a good night! Gotta love Pinterest! I've only made the creamy spaghetti in the oven before and it's just so good! I haven't tried the crockpot version which I'm sure is equally as good. I'm SO ready to try some of these. My boyfriend and I were never really taught how to cook so easy is good! I've been LOVING trying new recipes from Pinterest lately. So far my favorites are: http://www.skinnytaste.com/2011/04/chicken-rollatini-with-spinach-alla.html & http://www.crumbblog.com/2011/09/secret-recipe-club-1-killer-artichoke-bread.html. Yum!! 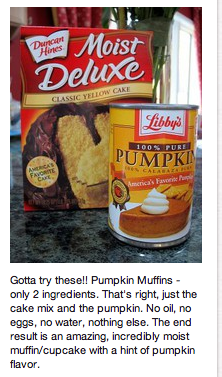 I am really looking forward to trying those pumpkin cupcakes! Everything looks so great! Makes me wish I could cook! Glad to hear you liked the Crockpot spaghetti recipe, I thought about it last night when I was making "eh" non-Crockpot spaghetti for dinner..
Chicken Tortilla soup is a family favorite in my house! Especialy on a rainy cold day. Loved the ground beef and veggie soup you recommended! I love the mummy dogs! 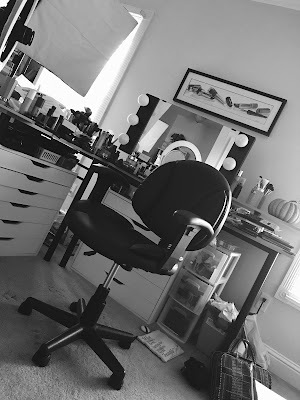 I usually skip over non-makeup posts, but I decided to check this one out, and super glad I did! I can't wait to try and make the enchilada soup you suggested! Thanks for sharing!!! Great Post. 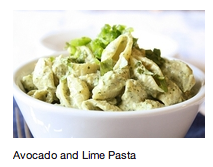 I'm very exciped to try the pasta salad because I have been looking for something to do with avacados. Just wondering if you have a list of ingredients for your Mom'a apple cake and pastry!! The pumpkin and spice cake mix also makes great cookies and bread - sometimes I mix some orange juice and powdered sugar to make a glaze for the top - the brownie and pumpkin brownies that were mentioned above are fabulous as well! I think I'm making the spaghetti tonight! Hi...PEMANGGANG AJAIB murah disini.Klu berminat email ya. 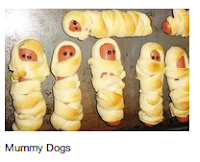 The mummy dogs look adorable! Try devils food cake mix, chocolate chips and the pumpkin. It makes the best muffin/brownie! Cures a chocolate craving anytime! I love your recipe photos! Emily , I love your recipes ideas, specially the crock pot ones. I'm not a fan of cooking, but I tried your tacos recipe and on my way to try the creamy spaghetti. Thank you for sharing.